Kayaking is a great way to exercise while being able to explore the outdoors at the same time. There are though, so many different types of boat available for different purposes that is can be tricky to know how to pick a kayak that will be suitable for your needs. If you are thinking of taking up kayaking as a hobby or past time then keep on reading, because in this article we will look at the best ways to get started, and what to look out for in the products available. Kayaking, as opposed to canoeing, is when you paddle an enclosed boat, that you sit in, with double ended kayak paddles. It’s a great way to get out on to flat water, such as a river or a lake, but is also a popular way to traverse more inhospitable environments, such as oceans or even white water facilities. It’s a very popular sport around the world, and it’s more than likely that there will be a club near you that you can join. Before you buy your own kayak, it might be worth joining a local club where you can have the chance to try it out and learn the techniques used to paddle through the water. Buying your own boat can prove quite costly, so it’s important you have a good understanding of what you’re looking for before proceeding with a purchase. Clubs are a great way to do this, and also allow you to meet other like-minded people that you can go out on to the river with. These types of kayak are very stable and easy to manoeuvre, are capable of carrying awkward loads like barbeques or coolers, and are great for exploring areas of calm water. These types of kayak have you sitting inside the hull of the boat and being surrounded by the walls. You can attach a spray deck to keep you completely dry within, and they are more responsive to steer. Sea Kayaks are specifically designed for paddling on the ocean, and are longer than a normal kayak to provide extra stability in the waves. These types are made from a more resistant material so there won’t be as much of a risk of damaging the boat if you hit rocks in the river. 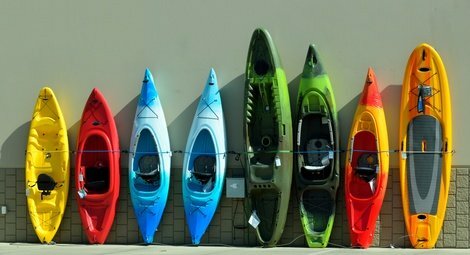 Now we have briefly looked at the different types of kayak, it should be easier for you to decide on what type of one you are looking to buy. If you are a beginner, or looking for something that is stable so you can paddle on your local river or lake, then you will want to get a recreational sit in kayak. If it’s more for fun in the water, and you don’t mind getting wet, then maybe a sit on kayak is more suited to you, because you can take more equipment with you. If you’re an experienced paddler, on the other hand, maybe a white water kayak or ocean kayak is more suited for you, depending on where you want to go. Some kayaks can be tricky to balance, a skill that comes with experience, so if you are new to kayaking you need to ensure you have a stable boat so you can spend your time perfecting your technique rather than balancing. ​If you are planning on fishing from your kayak, for example, you need to ensure there is plenty of storage space for everything you bring with you. A small kayak may not be ideal for this, so be aware of the dimensions. ​Where will you be paddling? If you will be paddling on calm water you won’t need as sturdy as boat as you will need if you’ll be going out on the ocean or white water paddling. Second hand boats can be a lot cheaper, so are a good way to get into kayaking without having to spend so much in the first place. Of course buying a new boat will mean you get the latest technology and a warranty, so this comes down to preference. There’s a reason why kayaking is becoming more and more popular. Not only is it a great way to exercise and get out on the water, but technology has improved to a point where the equipment is more than affordable. There are, though, lots of different designs and models, so it’s important you have an idea of the features you want so you know how to pick a kayak that is perfect for you. Benefits of Kayaking; Why You Should Pick Up A Paddle! How to Strap Kayak to Roof Rack?